Alden had some custom, homemade guitar for Guitar Hero (knobs all over it) and also a crazy homemade light gun for the shooting games. Instead of a trigger, it had a switch like this, you know – a metal toggle switch like in airplanes. It also had a thing you could turn that focused the beam from a shotgun blast that took up the whole screen to sniper shot that was accurate down to a few pixels. I was playing a game with it when we got attacked for real and I had to take out our attackers. Luckily, the gun could be switched to laser mode. You couldn’t see the beam but only the contact – a little blue dot burning a hole in your target. The gun’s silly looking - made out of funny white squishy plastic. The guitar’s normal but has HUGE knobs all over it. Nearly two years later, on February 2nd, 2008 I went to Alden's house for his wife's birthday party. Alden does not own Guitar Hero, a modified fake guitar, nor a homemade light zapper. Some people did end up playing some video games, but I did not participate. We did not get attacked. None of the things in my premonition had come to be. However, at the end of the night, Alden gave me his spare Wii Zapper because he had gotten two of them for Christmas. 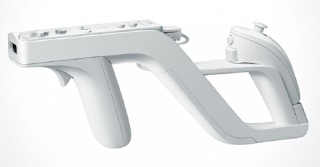 As you may or may not know, the Wii Zapper did not exist in 2006 when I dreamed of that silly white plastic gun. Another thing you may or may not know is that the on-screen aimer for the Wii Zapper is a blue dot. This premonition does not seem to have held any importance so far, but it's closer than anything I've heard from Nostradamus.